It was a very heartwarming experience for everybody, volunteers, refugees and me. 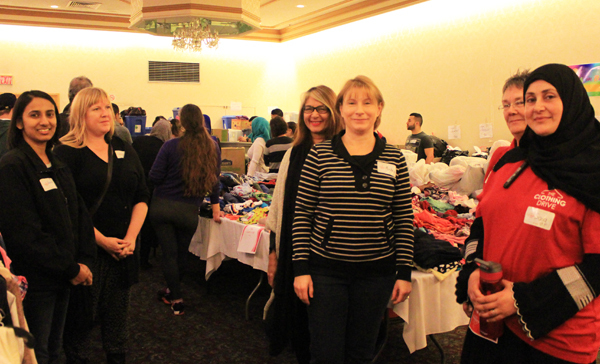 For weeks a group of Toronto volunteers led by Julie Mahfouz Rezvani have been organizing, not just a clothing drive, but a place to set up a distribution centre of donated clothes for Syrian refugees. Yesterday morning, I saw some of the results of their efforts. At the Toronto Plaza Hotel, the Canadian government was housing hundreds of refugees. 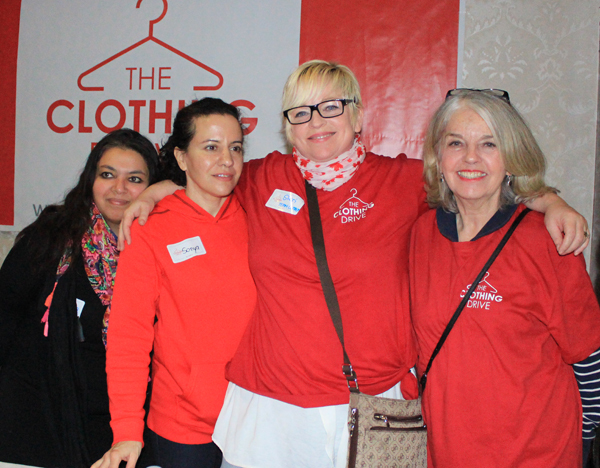 The night before, at little notice, a team of these volunteers had to move hundreds of bins of clothing from its clothing centre to the hotel, a distance, according to Google, of about 22 kilometers. Yesterday morning when I arrived to take pictures at the hotel, the clothes were neatly set out on tables or hung on racks, each section labelled in English and Arabic and sorted according to gender and sizes. The volunteers must have worked all night. A platoon of eager volunteers was being briefed. The volunteers then lined the tables ready to be assigned a place so they could give toys to the children for example. Each volunteer was labelled with her or his name. 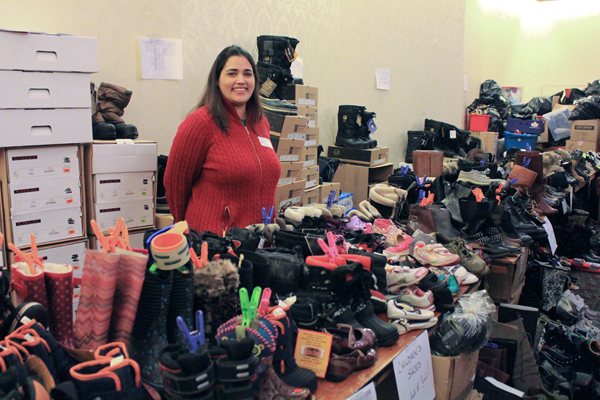 Some tables were full of boots and shoes. Chairs were available so people could easily try on the footwear. Then the Syrian families were admitted to the ballroom. 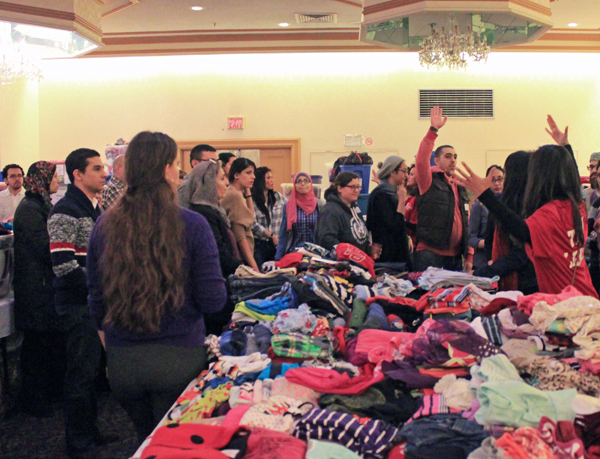 They had lined up to spend an hour each to choose the free clothing that they needed for the Canadian winter. I thought the arrangement was brilliant. Instead of busing 570 people to Scarborough to pick up the clothes, the clothes went to the hotel where the recipients were staying. Many of the volunteers appeared to be Arabic speakers. The others were from a variety of the cultures that make up Toronto. It was great to see representatives from different communities working together. I watched the volunteers help the children. I asked a couple Syrian women if I could take a picture of them. They willingly posed until I explained the picture might be on a blog. “They don’t want men to see their faces,” explained a translator as one woman looked at me as if I was trying to kill her. “Please delete the photo.” I wondered how they felt about the many men in the room but of course didn’t ask. I did get permission to take a photo of a family, and noticed that the wife’s face was covered. What an emotional adjustment this move must be for all these newcomers! 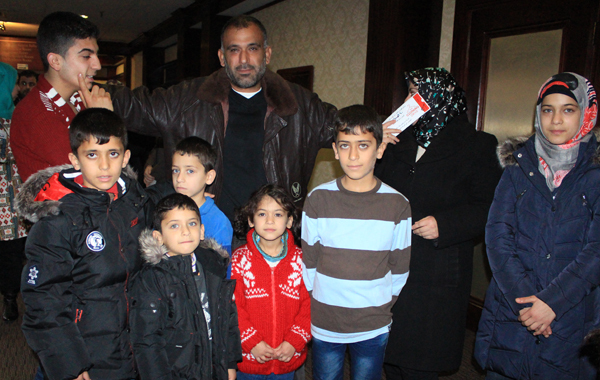 This group of Syrian refugees was housed temporarily in the Plaza Hotel and will be moved to other parts of Canada. “We hope we don’t have to take any clothes back to Victoria Park this evening,” said one of The Clothing Drive’s organizers, Anne Wright-Howard. 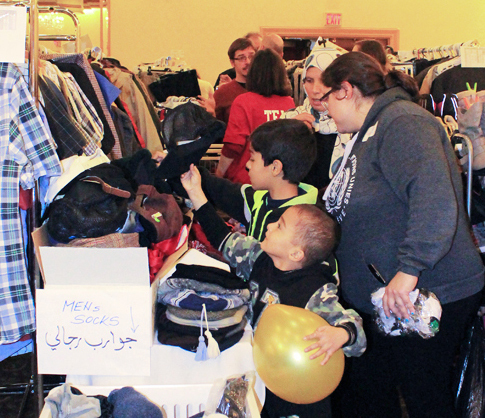 The depletion of its current clothing stock means The Clothing Drive will need more clothes as thousands more refugees arrive in Toronto. For more information about donating clothes and toys to and volunteering with The Clothing Drive, see: https://www.facebook.com/groups/theclothingdrive/. Its Facebook page will keep you updated on its work. It is at 1682 Victoria Park Avenue. Please add your comments below to this Blog. 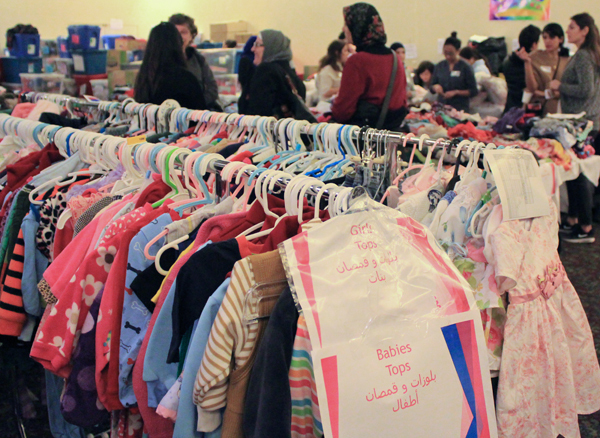 This is quite wonderful for refugees to have so much choice in choosing clothing. Sorry but we couldn’t put your blog on The Clothing Drive Face Book page. A number of us found this comment to be insensitive to different cultural practices and not in keeping with the spirit of multiculturalism. Thanks Ruth for a lovely uplifting post. I don’t think it is insensitive to express curiosity about different cultural practices. I’m sure our new arrivals wonder about our cultural practices too. Learning about each other starts with curiosity.